George the Dragon Slayer with Pewter Dragon Lid LE German Beer Stein. George the Dragonslayer Beer Stein. Made from stoneware with pewter lid and decal. Approximately 11.5 inches tall (29cm). Stamped on bottom with Manufacturers Logo and Made in Germany. 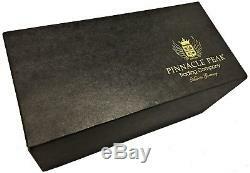 Includes original Pinnacle Peak Trading gift box. 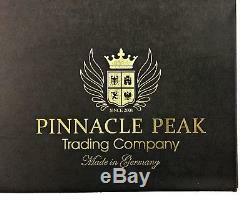 Manufactured for Pinnacle Peak Trading by Zoeller and Born. Thank your for visiting our listing. DecorationWarehouse and Home and Holiday Shops appreciates your business! George the Dragon Slayer with Pewter Dragon Lid LE German Beer Stein. 5 L" is in sale since Thursday, September 13, 2018. This item is in the category "Collectibles\Breweriana, Beer\Drinkware, Steins\Lidded Steins\Germany". The seller is "decorationwarehouse" and is located in Tempe, AZ. This item can be shipped to United States, Canada, United Kingdom, Denmark, Romania, Slovakia, Bulgaria, Czech republic, Finland, Hungary, Latvia, Lithuania, Malta, Estonia, Australia, Greece, Portugal, Cyprus, Slovenia, Japan, China, Sweden, South Korea, Indonesia, Taiwan, South africa, Thailand, Belgium, France, Hong Kong, Ireland, Netherlands, Poland, Spain, Italy, Germany, Austria, Israel, Mexico, New Zealand, Philippines, Singapore, Switzerland, Norway, Ukraine, United arab emirates, Qatar, Kuwait, Bahrain, Croatia, Malaysia, Brazil, Chile, Colombia, Costa rica, Dominican republic, Panama, Trinidad and tobago, Guatemala, El salvador, Honduras, Jamaica, Antigua and barbuda, Aruba, Belize, Dominica, Grenada, Saint kitts and nevis, Saint lucia, Montserrat, Turks and caicos islands, Barbados, Bangladesh, Bermuda, Brunei darussalam, Bolivia, Ecuador, Egypt, French guiana, Guernsey, Gibraltar, Guadeloupe, Iceland, Jersey, Jordan, Cambodia, Cayman islands, Liechtenstein, Sri lanka, Luxembourg, Monaco, Macao, Martinique, Maldives, Nicaragua, Oman, Peru, Pakistan, Paraguay, Reunion.